Neuronal migration is the means for the formation of the neuronal organization of the spinal cord, brainstem, cerebellum, deep nuclei, and cortex (13). Neuroblasts proliferate in subependymal zone: Neuroblasts (primitive neurons) proliferate in the subependymal zone of the neural tube adjacent to the central canal of the spinal cord or the ventricles of the brain. Subsequent migration to mature site: As neuroblasts mature, their progeny migrate from the subependymal zone to their final destinations. 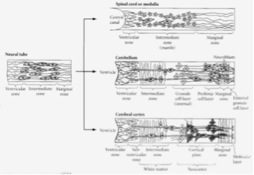 Cell bodies in subependymal zone: In the spinal cord cells remain near the subependymal zone to form the central gray matter of the spinal cord and extend axonal processes toward the periphery of the spinal cord. Axons (white matter) surrounds gray: The surrounding spinal cord white matter is comprised of local and ascending white matter tracts generated in the spinal cord gray matter and descending tracts from supranuclear sources. Axons intermixed with nuclei: In the brainstem cells migrate toward, and differentiate into, various nuclei derived from the alar and basal plate neurons; intermixture of axonal processes with nuclei gives the particular brainstem structure. Roof of ventricle: A germinal zone in the roof of the fourth ventricle produces cells that migrate peripherally to form the cerebellar nuclei and Purkinje layer. Rhombic lips lateral to ventricle: A second germinal zone in the rhombic lips lateral to the fourth ventricle form the basket and stellate cells. These cells migrate circumferentially around the surface of the cerebellum to form the external granular layer. Later, daughter cells in the external granular layer migrate inward through the Purkinje cells and form the internal granular layer. Migration takes place along Bergman glia that guide neurons to their final destinations. Walls of third ventricle: Thalamus/hypothalamus and globus pallidus form from migration of cells in the diencephalic germinal zone along the walls of the third ventricle. The caudate, putamen, and amygdala form from similar germinal zones in the ganglionic eminence of the lateral ventricle. Migration from ependymal zone: Early cells in the ependymal zone migrate to form the marginal later (layer 1 of the cortex. Development of germinal matrix: A subventricular (germinal matrix) zone later develops immediately subjacent to the ventricular ependyma. Migration from germinal matrix: Cells from the germinal matrix migrate to the cortex in an inside-out pattern with layer 6 neurons forming first, and successive waves of migration forming more superficial cortical layers. Multiplication of glial cells: Locally multiplying, presumably glial cells populate the cortex. Terminal differentiation of ependymal cells: Remaining non-migrating germinal matrix produces ependymal cells.